.018" .020" .016" x .022" .018" x .025" .019" x .025"
Proforce Stainless Steel Arches with Vertical Poles: They are excellent for retraction. The brass post is welded to the arch. The anterior retraction can be used with Class II elastics or closed NiTi coil. NiTi Thermal Spee Round 10u. NiTi Thermal Spee Rectangular 10u. NiTi Thermal "for slot .018" 5u. Stainless Steel "for slot .018" 5u. 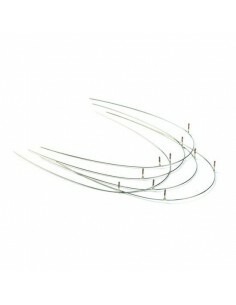 Stainless Steel Keyhole Loops 10u.